Chocolate Dipped & Decorated Oreo Cookies make perfect Christening or Baptism Party Favors! Our delicious Oreo Cookie Favors are adorned with a pretty edible Cross in the middle. A truly delicious Edible Party Favor for your guest to enjoy! These delectable treats are dipped in your choice Milk Chocolate, Dark Chocolate, or White Chocolate! Our Oreo Cookie Favors are made out of the finest Belgian Chocolate and taste amazing! 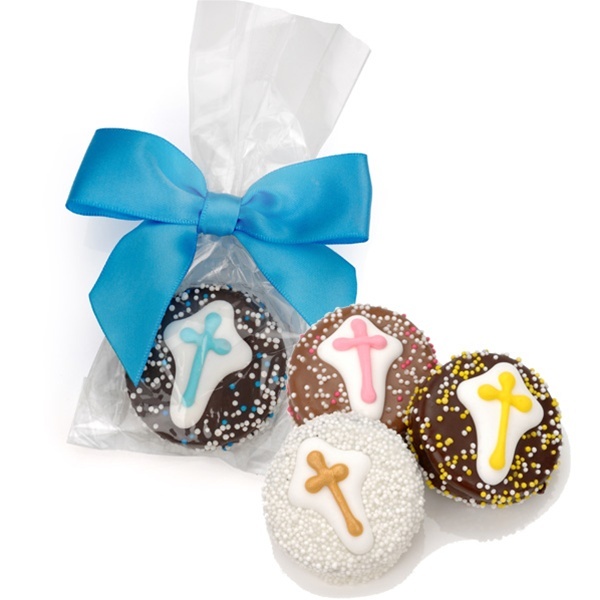 These Oreos are hand decorated with Royal Icing Crosses in Pretty Pink, Baby Blue, Yellow, Gold or Silver! Sprinkled with a delicate shower of nonpareils to match - these cookies are a perfectly SWEET addition to your Christening or Baptism Party! In warm weather, you have the option of choosing CHOCOLATE FLAVORED ICING instead of CHOCOLATE. The icing tastes just as good as the chocolate! Available individually wrapped in Cello Bags and heat sealed at both ends for freshness. You can even add a lush Satin Bow to make them extra special!